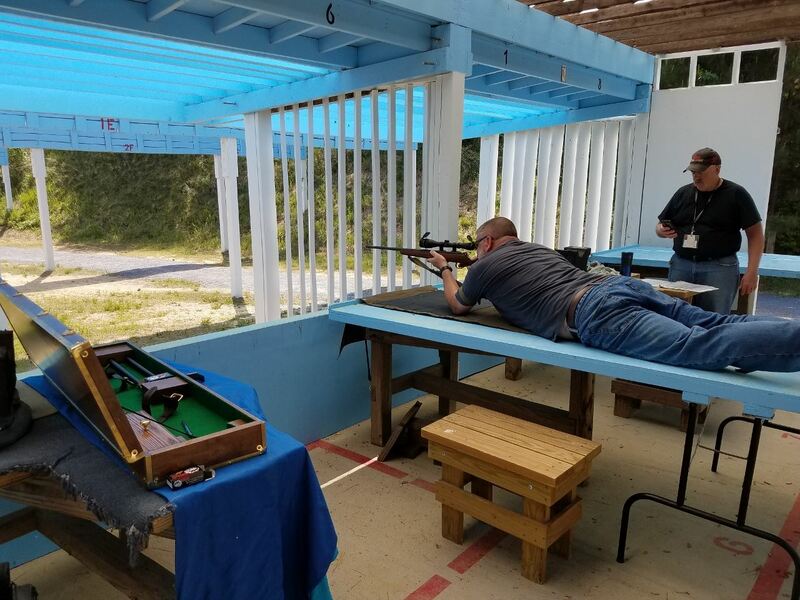 The CMP National Rimfire Sporter Match offers shooters a recreation oriented competition where they use smallbore sporter rifles (plinking and small game rimfire rifles) commonly owned by almost all gun enthusiasts. This is a unique match where all you need is a rifle and ammo. 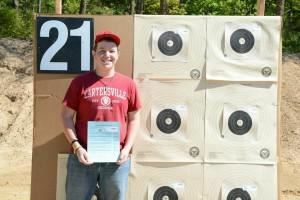 The Rimfire Sporter course of fire is challenging, new shooters can successfully complete it while experienced shooters find it uniquely challenging. Firing is done at 50 and 25 yards on a target with a 1.78" ten-ring and an 18" outer one-ring. The target is simple enough for a beginner to hit, yet challenging enough that only one competitor in the history of the match has ever fired a perfect 600x600 score. See below for More Info and our upcoming matches. Additional info can be found on the in this CMP Rimfire Sporter Rifle Guide and on the CMP Sporter Rifle website. Terrific day for a match. The wind was calm and the temperature was near perfect. It was great seeing everyone again. With our calendar problems resolved I hope to see a better turnout next month. Bolt actions dominated the field today with CZ making up the bulk of them. Jake and Mark led once again with Jake turning in a very respectable score and 21 bullseyes, using iron sights! Congrats to Jake! Hope to see everyone at the next match coming up in May. Mark S - October 13, 2018 - 589 with 21 bullseyes. Match begins at 9 am. Non-members contact match director to coordinate gate access. T-Class (Telescopic): Conventional rimfire rifles equipped with telescopic/optical sights, maximum 6X magnification. If Aperture Class is not offered, conventional rifles with aperture sights will be included in this class. O-Class (Open): Convention rimfire rifles equipped with traditional open V- or U-notch style rear sights and front post- or bead-sights. Aperture Class (Optional): Conventional rimfire rifles equipped with aperture/peep sights. Tactical: Modern military-style semi-automatic rifles in .22LR caliber, with either open-sights, aperture sights, or optics. Sporter type rimfire rifles weighing no more than 7 1/2 pounds, with sights and sling. shooters with manually operated actions are given extra time in rapid-fire to compensate for the difference. Fire ten shots for record slow-fire in the prone position, followed by two five-shot rapid-fire series. Fire ten shots slow fire and two five-shot rapid-fire series in the sitting or kneeling position. Targets are then placed at the 25-yard line where shooters conclude with ten shots slow fire and two five-shot rapid-fire series in the standing position. At Sanners we are running our COFs at 50 yards due to time constraints in setting up the 25 yard line. Maximum score 600 - 6 targets with 10 shots on each.